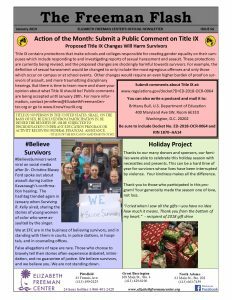 Action of the Month: Title IX changes will harm survivors. Here’s how to speak out. Thanks to you, our holiday project was a huge success! Read about the great work young choreographers are doing in our area to bring attention to sexual assault. We hope you are all having a warm and wonderful winter. 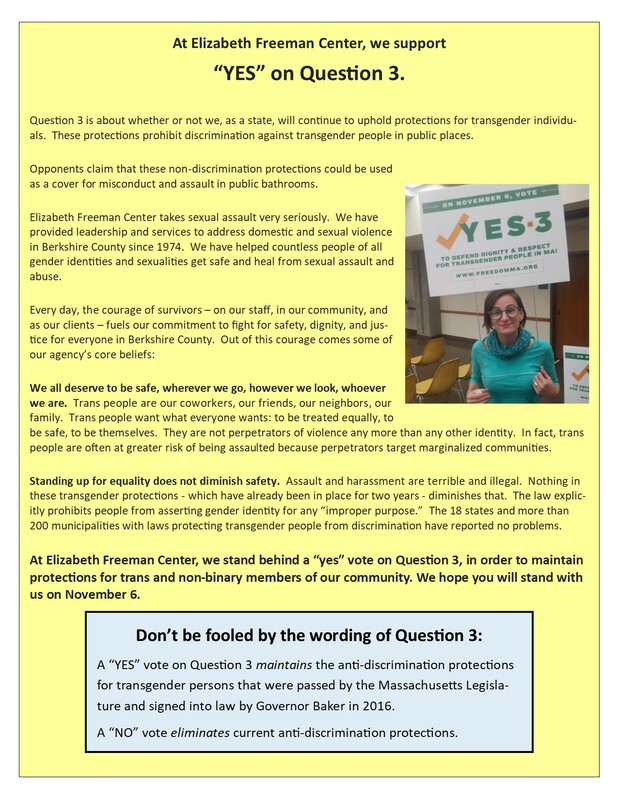 At Elizabeth Freeman Center, we stand behind a “Yes” vote on Question 3, to maintain protections for trans and non-binary members of our community. We all deserve to be safe, wherever we go, however we look, whoever we are. This law supports our deeply-held belief that no one should suffer harassment, violence, or discrimination based on gender. We hope you will stand with us on November 6 in voting “Yes”. In supporting Yes on 3, we are joined by other organizations across Massachusetts, including law enforcement such as the Pittsfield and Lenox Police Chiefs, anti-violence organizations including Jane Doe Inc and The Network/La Red, elected officials including North Adams Mayor Tom Bernard, Attorney General Maura Healey and Governor Charlie Baker, and newspapers including the Berkshire Eagle and the Boston Globe. We hope you join us in voting “Yes” on 3. 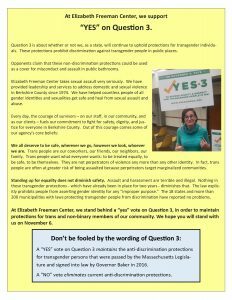 Please remember that a Yes vote will uphold our current non-discrimination protections, and that this question may be on the back of your ballot! 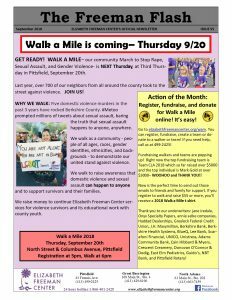 Walk A Mile is Thursday September 20th! 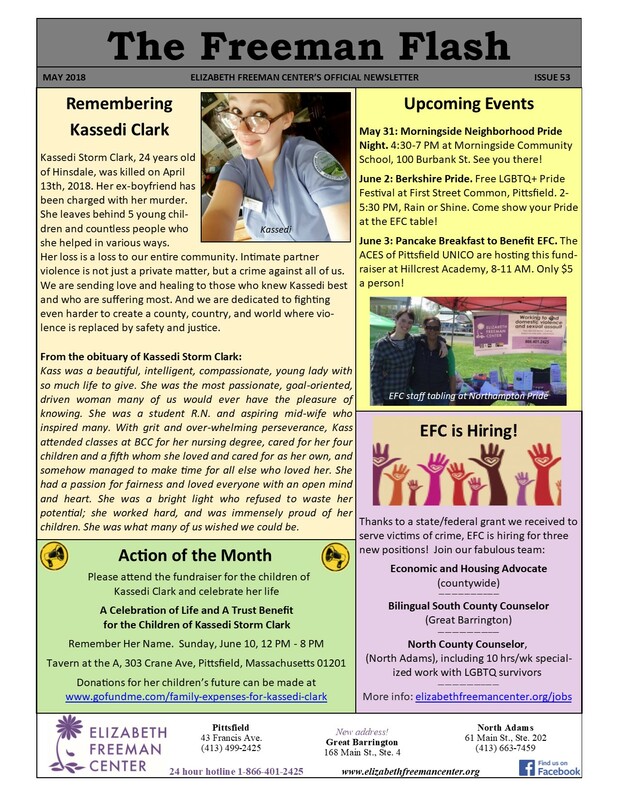 Read all about it, and all the other exciting happenings at Elizabeth Freeman Center, in this month’s Freeman Flash. 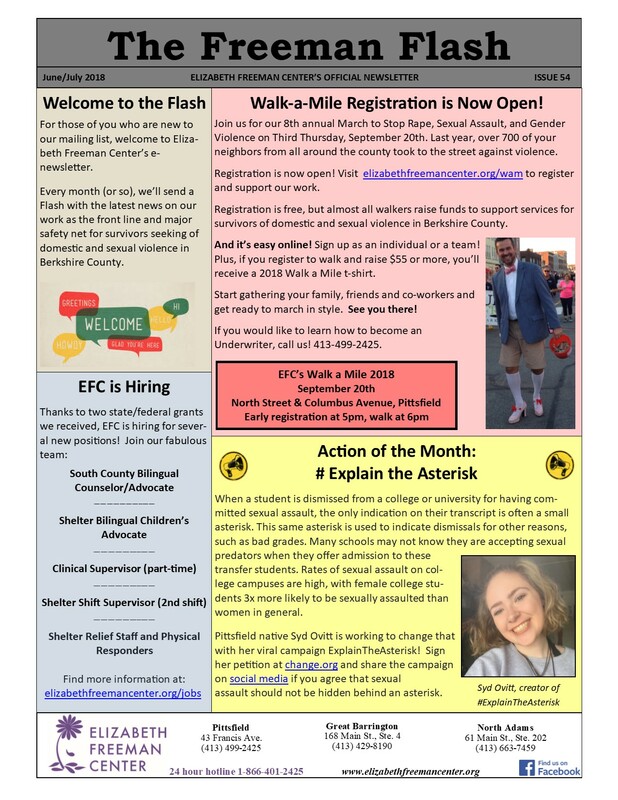 Sign up for the Freeman Flash, our monthly newsletter.